Pearl Gourami is very attractive and very hardy fish so it is very easy to keep for the beginners as well have experienced fish-keepers. The body of Pearl Gourami is compressed and elongated. Its fins are thin as well as long, looking like feelers. Its mouth is always up. There are flakes of green color on the body which resemble appearance of pearls. One more specialty on the body of Pearl Gourami is a long black line. This line starts from their mouth and goes up to the tail where it becomes a spot. Pearl Gouramis like to live in areas of heavy plantation in the nature, so they are happy with the same surroundings in the aquarium. In addition to the base plants, you should also provide some floating plants as a place for their hiding. There should not be much light in the aquarium and the substrate should preferably be of a dark shade. Pearl Gouramis like to live in slightly acidic water but they can adapt to different conditions also. They can easily live in a community aquarium with other species. However you should take care not to keep aggressive species with them. Pearl Gouramis will be happy to eat most of the foods which are offered to pet fish. However for balanced nutrition, you should offer them for vegetables like spinach, lettuce and peas. Occasionally, you can feed them with live food such as blood-worms and brine shrimp which will help for preparing themselves for breeding. The males of Pearl Gouramis are different from the females because of their colors. They have a red and orange color combination on their throat as well as on their breast. Their dorsal fin is also much longer and pointed. On the other hand, the females will have slightly bigger body than the males. Before their breeding begins, you should feed Pearl Gouramis some good live food like brine shrimp. You should also reduce the water level of the tank, and keep it up to 8 inches. Increase the temperature of the tank up to 80° F and leave lot of floating plants in the tank. The males will start building a bubble nest and their spawning will begin below it. At the time of spawning the males will wrap their body around the body of the females and the females will start releasing eggs. The females can lay hundreds of legs at a time. You should remove the females from the tank after laying the eggs. The young ones will come out after 3 to 5 days and they will start swimming. You should immediately remove the males from the tank because they may start chasing the young ones and troubling them. The young ones should be fed with baby brine shrimp up to two weeks. Crushed flakes of food can also be offered to them. After about a month later, they will grow up and you can shift them to the main tank. During this time, you should look after the conditions of water and you should change it at least every three days. What other very important feature of Pearl Gourami is their habit of creating waste. They will generate a lot of waste which will be accumulated at the bottom of the tank. This waste will quickly start contaminating the entire water. So when you are keeping Pearl Gouramis, you must keep the water clean both by keeping a good filtration system and by physically removing the dirt from the tank. If they are forced to stay in dirty water, they will immediately get sick. If the fry is kept in dirty water, their growth will be poor. One more precaution you need to take about Pearl Gourami is regarding their habit of eating. When you feed them to the fish in the tank, the fast more wing fish will grab the folder quickly. However, Pearl Gourami will wait for others to grab the food and they will just collect the leftovers from the bottom of the aquarium. So if you are keeping them with fast moving fish, they will remain hungry. 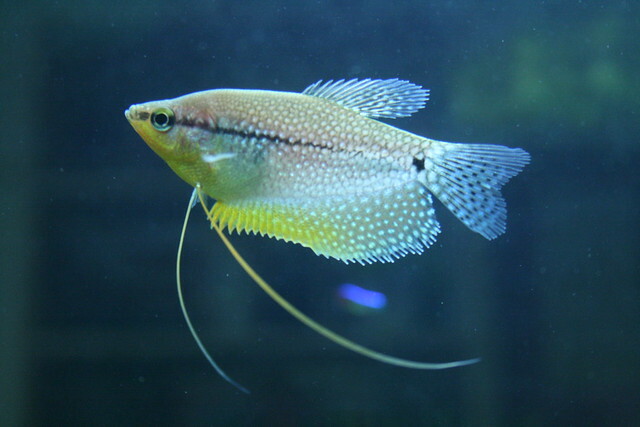 The Pearl Gourami , Trichogaster leeri, is also called the Lace Gourami, Diamond Gourami and the Mosaic Gourami, and sometimes the Red Breasted Gourami. It is native to Thailand, Malaysia and Indonesia. It has been introduced to Colombia, The Philippines and Taiwan. It can grow to about 12 centimetres (4 1/2 inches) long. It will live for up to 8 years. This fish comes from tropical countries, and it needs warm water. A temperature of between 24 and 28 degrees C (75- 83 degrees F) is suitable. They come from soft acid water, but the adults are moderately adaptable and a pH of between 6.0 and 7.5 with a dH of up to 19 is all right for maintaining them. This fish comes from still or sluggishly moving water bodies with a lot of plants in, so at least part of their aquarium needs to have a lot of plants. Ideally these should include floating plants. The Pearl Gourami is a labyrinth fish and can breathe air as well as water, so it needs access to the air. It is better if the air is of a similar temperature to the water and is humid, so the tank should be well covered. This fish is an easily fed omnivore. It will eat all common fish foods. Its diet should include foods of both animal origin like live or frozen bloodworms, daphnia or brine shrimp, and also things a vegetable origin like algae wafers, lettuce or lightly cooked zucchini. Although the most popular fish for eating Hydra is the Blue Gourami , Pearl Gouramis also eat it readily. They are smaller and more peaceful than Blue Gouramis and are sometimes kept in tanks as small as 60 Litres (15 US gallons), so there are circumstances where the Pearl Gourami would be the fish of choice to get rid of hydra. The Pearl Gourami has a soft body and care needs to be taken when handling this fish. It is a very peaceful fish which is often, but not always, shy. It can safely be put with fish smaller than itself although I would not put it with fish as small as Neon Tetras, but most of the more peaceful tetras are suitable companions as well as all the corydoras catfish like the Bronze Catfish. You need to avoid fish that nip fins or are large and aggressive. Steve Challis has many other fish fact sheets and other articles on http://www.bettatrading.com.au including pictures and breeding information about the Pearl Gourami at http://www.bettatrading.com.au/Pearl-Gourami-Fact-Sheet.php.